Dr. Jackson takes care of patients from newborn babies to 21 years old. It all starts with a pre-natal visit. That’s where the expectant mother (and expectant dad too, of course) can come and meet with the doctor and get all your questions answered. 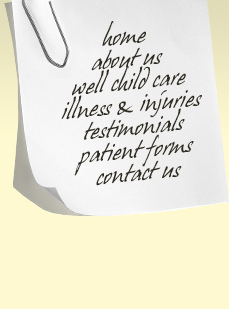 We want to make sure that you have a pediatrician you are happy with. During the neonatal period (up to one month) you will want to have close contact with your pediatrician. Your baby is changing so fast. In the infant stage (up to one year) the doctor will keep a close eye on growth and development. When your baby becomes a toddler (they’re walking now) they can get more bumps and bruises. The preschool and school age kids tend to come home with the sniffles and who knows what else, and we’re here to help you with that. And then there’s that special time--your baby is no longer a baby but is becoming a young woman and a young man. They need a doctor they know and trust that can help through that time as well.